(Trent Nelson | The Salt Lake Tribune) Real Salt Lake vs. Los Angeles Football Club, MLS soccer at Rio Tinto Stadium in Sandy, Saturday March 10, 2018. Real Salt Lake midfielder Albert Rusnak (11). Houston • The schedule to start the season won’t be kind to Real Salt Lake, which has six of its first nine games on the road. Saturday against the Houston Dynamo was an opportunity to get on the right side of its road form early, and for the most part, the team was pleased with the effort. RSL and Houston ended in a 1-1 draw in the season opener for both at the BBVA Compass Stadium. Real took a one-goal lead heading into the second half, but the Dynamo’s equalizer ensured both teams would come away from the match with only one point in the standings. 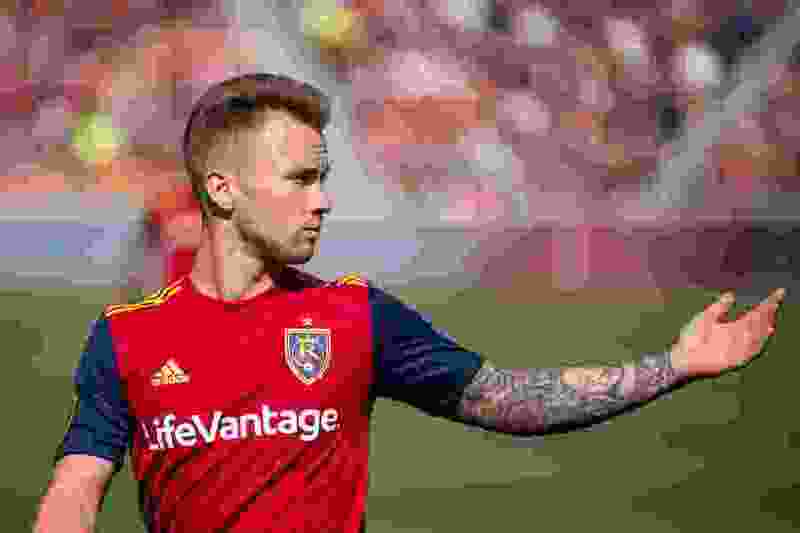 Even earning one point on the road last season proved difficult for RSL, which won only three road games in the entire 2018 regular season. A refrain during the preseason was that Real was going to pay more attention to defense before the games started to matter, a wrinkle that had some players grumbling, but others buying in to the idea that it would give the team a good foundation to start the year. Real gave up just one shot on goal, blocked five of Houston’s shots and tallied three defensive blocks. The Dynamo’s lone goal — a flick of Mauro Manotas’ right heel in the 62nd minute — came off a defensive miscommunication that allowed Adam Lundkvist’s cross to find Manotas, RSL keeper Nick Rimando said. Rusnák scored in the 40th minute to give Real Salt Lake a 1-0 lead. Corey Baird dribbled from the backfield into the attacking third and tapped the ball to Rusnák at the top of the 18-yard box. It took only a soft touch to get Rusnák away from his defender and give him the sliver of space he needed to shoot. Rusnák, thinking back, said he may have gotten lucky getting free on the first touch after Baird’s pass. But he was so close to the goal, he said, that he just had to find a way to find the back of the net. While Saturday marked the first quote-unquote meaningful game for RSL, Houston already has a couple under its belt. The Dynamo just played on Tuesday against Guastatoya in a CONCACAF Champions League match. They play again Tuesday against Tigres from Liga MX in the CONCACAF quarterfinals. RSL coach Mike Petke acknowledged that Houston is probably in better overall shape than his team at this point of the season, and said there may have been some tired legs toward the end of game for his players. But he’ll take the result. Justen Glad was officially ruled out after breaking his toe on Thursday. … Everton Luiz, Kyle Beckerman and Aaron Herrera all picked up yellow cards for unsporting behavior. … Matias Vera was ejected late in the game after receiving his second yellow card.